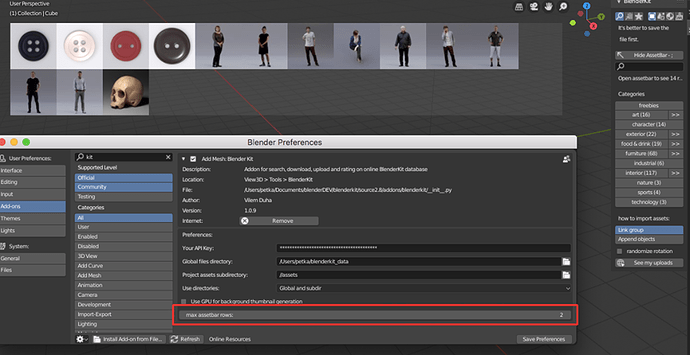 I’m currently trying to upload my latest model and I get a warning that says “Uploaded models won’t be available in b2.79” but the model is made in Blender 2.79 and I am trying to upload it with 2.79? Hi NinthJake - that obviously slipped into the last version, not sure how, but mainly because now I have to maintain 2 addons at once, and this message only belongs to 2.8. The message is a bug, model will be available with 2.79. I hope to release new update with fixes today. B.t.w. do you get regular messages from our admin address regarding validation? we can’t estimate how many of these end in spam for users. I am getting occasional verification emails but I don’t think I get one for every item. A few days ago I got an email for an old validation. Hi NinthJake, well the verification mails are sent manually by me but I sent you also a message about how we plan to have ‘validated’ creators, basically creators on which we don’t check the quality because it’s constantly good. And here is a little preview from 2.8. Since my GPUs died on both my computers (!) this has no EEVEE in it, but I believe it’s still fun to watch. Ah, yes I got that email. Is there any addition to the publishing workflow for validated creators. Like do I still mark my asset for validation or is there any changes I should be aware of? Hi NinthJake, regarding validation, it will be kept as it is for some time, In the future, there will be the difference that user will be able to mark assets as private - then these won’t go to validation, this is meant if somebody wants to either store assets they don’t want to share, or to store assets they e.g. own because they bought them, and want them to be available anywhere for them. Just a small note, today, we had to quickly update the addon since we realized a small update in the blender 2.8 code did cause several uploads not work properly. We fixed all uploads that were involved, but updating the addon is recomended. After all, we have to say - beta is still beta, and it’s very valid in a case where blender 2.8 might change API any day, so we are just trying to follow. If your upload didn’t work right after you uploaded, it should be fixed now. and good models I validated the second one too. The material I assigned to you by error when I was validating other assets, I’m sorry, it’s a test I uploaded. It’s fixed now. Also, playing with the UI in 2.8 a bit, now you can enable multirow layout and also the assetbar disappears when you drag and drop. Hi! I see small changes in the metadata make the model go through validation again, doesn’t it? I just changed the name of the model because I noticed I left an underscore between the words. Also, I’ll upload a couple of closets today or tomorrow, I wonder in which category they should go. furniture -> shelving? Interior -> bedroom? I think is a bit confusing having the interior and furniture categories at the same time. With the metadata, there’s one single exception where the whole model has to be reuploaded. And that is when you change the name. The reason for this is, I wanted to have human readable name inside the file, and so if the name is changed, we have to store it in .blend file and reupload it. Regarding categories, I’d recommend furniture as long as it is furniture. It’s a valid critique, I know we should probably completely re-make the categories, but so far we had no time to work on it. Definitely, once we do it, we will help reorganize all assets ourselves, so creators don’t have extra work. It’s not inconvinent, but i’m a bit sorry to make you recheck an upload just because I forgot to double check the name was correct. As for the closets, i’ll put them in the furniture category then, but in which subcategory should they go? So next daily build tonight will be affected by this. At least it was easy to fix by renaming references to user_preferences for preferences on ui.py, ui_panels.py, download.py, paths.py, ratings.py, search.py, upload.py, utils.py, autothumb_model_bg.py and autothumb_material_bg.py. Like an RSS feed for API changes? Maybe on the wiki, but first we need to convince some dev to do it. The updated version fixing for the last API change is now onlin.